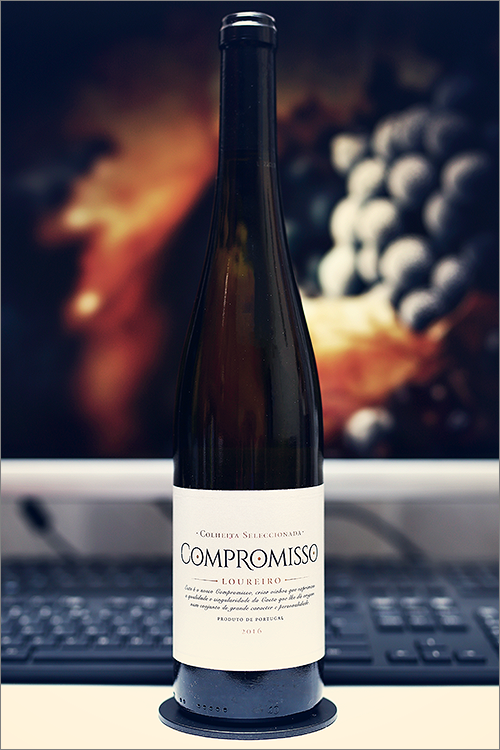 Today we are going to review a vinho verde wine – Compromisso Loureiro Colheita Seleccionada 2016 from Quinta Lixa. Vinho Verde is quickly becoming the visit card of Portugal – boozy-dry, crisp and citrusy-floral wines with typically low alcohol, making them an ideal quenching beverage. Vinho Verde is usually a blend of several white grapes, yet this one is a single varietal loureiro wine. This variety has been well known as one of the major grapes used in the making of the famous Vinho Verde wine, grown increasingly across the both sides of the border between Spain and Portugal. But enough theory, let’s find out just how good this wine is. On to the tasting! Very clear green color with topaz yellow shades towards the rim of the glass. The nose is strong, filled mostly with citrus fruits flavours: lime, green apple, gooseberry, bergamot, green pear, green melon, fresh cut grass, ripe lemon, green apricot, pineapple, chalkstone and some nunced hints of mango. The wine is dry, with moderate alcohol level, high acidity and ripe tannin. It tastes crisp, fresh and citrusy-mineral, a bit seedy yet quite appealing and smooth overall. The wine has a nuanced zesty accent, as it feels bit green, yet elegant and complex, with a fair overall balance. It has a medium-plus finish and a balanced, crisp and elegant aftertaste. This is definitely a great Wine of Portugal and the overall rating says the same, with 91.0 points scored it is right there, among the best wines we’ve tasted so far. Please click on the chart icon on the left in order to get to the wine rating page, where you can find all the wines we’ve tasted to date. Conclusion: this is definitely an elegant vinho verde wine in its prime form – ready to drink and not really worth for longer bottle ageing. We used to mention that it is always better to drink a wine a year too soon than a day too late, which is very true, especially for the highly aromatic wines like Vinho Verde. In order to amplify its mesmerizing aromatics, we would recommend to pair this wine with very light seafood dishes or slightly sweet citrus-based salads, like for example a summer-citrus-avocado salad or some citrusy seafood salad, as all the malic acids in the wine will be complemented well by the citric acids in the dish, which makes for an epic pairing indeed. Enjoy! © The WineStatistics ratings are based solely on our own knowledge of the world of wine and on our personal wine tastes, which may, or may not, differ from yours – the reader. There are no absolutes of right and wrong in wine appreciation.